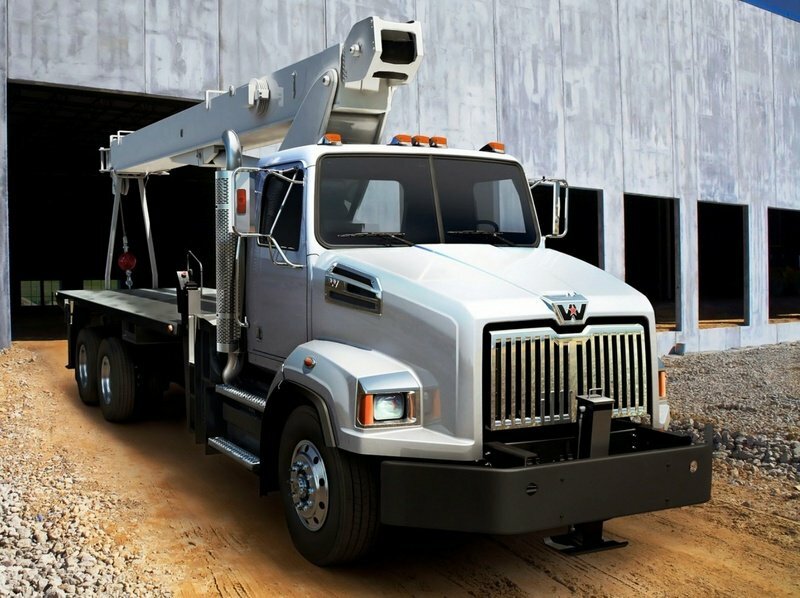 The Western Star 4700 vocational model was engineered to meet the highest standards for construction and municipal applications. Western Star was already known for its reliable trucks and the 4700 makes no exception, being hand built with maximum attention to every detail. 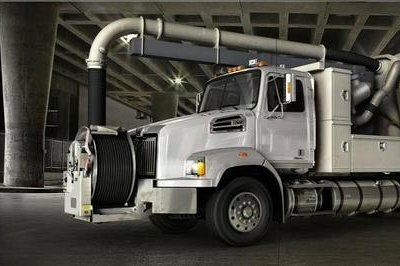 The truck is available in both SF (set forward axle) and SB (set BACK axle) configurations, and was designed especially for snow plow, dump, mixer, roll-off, crane and sewer vacuum applications. The Western Star 4700 is offered with a choice of Detroit and Cummins engines with maximum outputs between 260-350 hp. 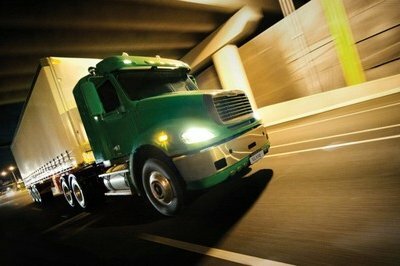 The 4700 is priced around $110.000 and has a maximum gross vehicle weight rating of up to 64,000 pounds. 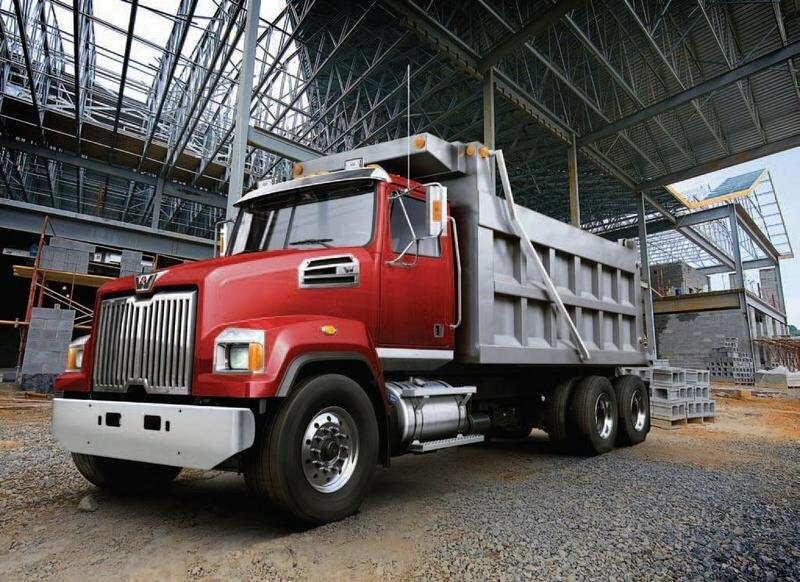 The Western Star 4700 has a rugged design enhanced by the conventional cab configuration. The long nose is dominated by a massive shiny grille with horizontal stripes and the company’s logo on top. The truck is also fitted with tasty chromed air intakes mounted on the side of the bonnet for extra ventilation. The rectangular headlights are mounted low and come with standard halogen lights for improved visibility. The hood tilts open pretty easy to a 90-degree and is equipped with special springs to reduce effort. 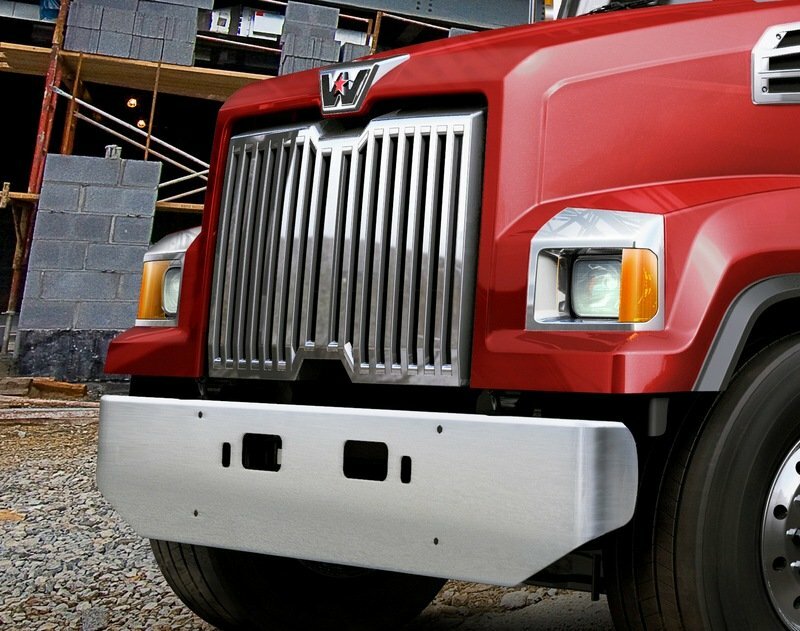 Unlike other truck cabs in the segment, which are built using lightweight aluminum, the 4700’s cab is all made of steel. Despite the fact that the steel cabins are significantly heavier than the aluminum units, the company choose this material because is tougher and more resistant to eventual accidents. Moreover, in order to be corrosion resistant the, steel-cabs have been galvannealed. The extra gussets and reinforcements were bonded, welded, dipped and then protected with a 17-stage e-coat process for long-lasting corrosion resistance and a superior paint finish. There are also available optional front frame extensions built from high resistant steel, with a straight-through rail design to eliminate bolt-on extensions. Whereas we’re still not 100-percent convinced by the interior design we have to admit that is a perfect match for the rugged exterior style. There are plenty of squared shapes and sharp lines to give the cabin a manly feel, but we find the rectangular air vents a bit too rudimentary for our tastes. While we like the wraparound design of the dash, we find it a bit cluttered and distracting. On the other hand, except for the HVAC controls which are placed a bit too low to be easy reached, the rest of the controls and switches are easy to use and have a logical layout. The overall built quality is also top notch and the rock hard materials seem ready to endure the most severe situations without whining. As most trucks in the business, space is far from being a problem and the 72 inch wide cab offers great flexibility and plenty of head- and leg-room. Combine that with a high driving position and an excellent visibility, and you’ll have one of the best working places on wheels available on today’s market. The side visibility is also good enough to keep you far from trouble. As with all external rear view mirrors these days, there is a blind spot area to consider, but the huge lenses helps keep this factor to a minimum. The captain seats are fitted with comfortable armrest and they even offer adequate side bolstering which is a rarity in this class. They also come with plenty of adjustments to help you get cozy behind the wheel. The steering wheel looks fairly good and is among the most attractive units that can be found at today’s trucks. We like its ergonomic two spoke design and also the tasty wood trim inserts which give it a touch of class. Western Star has also fitted its truck with plenty of useful storage spaces. Starting with the generous door pockets, continuing with the big storage box mounted between the seats and finishing with the big compartments fitted into the dash, everything is well placed and comfortable to use. On the other hand, we find the twin cup holders that hang at the bottom of the dash a bit too far to be reached easy, hence you’ll need to struggle a bit more than usual to get your cup of coffee. The truck also features a pretty smart wiring. Unlike other trucks in the segment, Western Start put the body builder interface connectors and transmission control unit in the cab to protect them from the elements. There is also available a convenient bolt-in pass-through plate in the cab floor, to eliminate unnecessary drilling, and a dedicated floor channel with an easy-to-remove top for easy access to the wires. The truck is powered by either Detroit Diesel or Cummins engines. The engines are also combined with SCR (Selective Catalytic Reduction) technology, which is a simple and cost efficient solution to meet the latest emission requirements. The Cummins ISC features a totally integrated emissions control system which includes a High Pressure Common Rail fuel injection system, a cooled-EGR subsystem, a Variable Geometry Turbocharger and a Particulate Filter. The Cummins ISC engine develops between 240-300 hp available from relatively low rpms. The Cummins ISL engine is available with ratings from 370-425 hp and offer 1200 lb-ft of peak torque. The engine has excellent towing abilities and can deal with steep inclines without problems. The ISL also comes with a capable engine brake which will come in handy when you’ll have to deal with downhill sections. Moreover, the engine braking capacity also reduces wear of the service brakes. 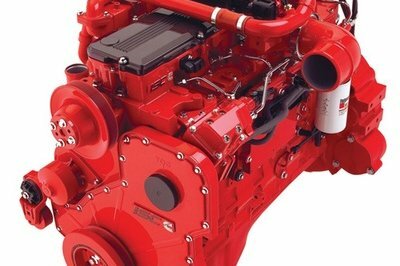 The Detroit DD13 develops between 350 – 470 hp and features an amplified common rail system, integrated engine brake, advanced time-based cooling system and a strong pull down to 1100 RPM for enhanced performance and efficiency. The engines are mated on the tried and tested Eaton Fuller transmissions which keep in leash those strong ponies without problems thanks to their well-choose gear ratios. To be able to deal effortlessly even with the biggest payloads, the Western Star 4700 is fitted with half-inch-thick, single-channel frame rails which also come custom drilled depending on the application. The truck’s steering isn’t something to rave about, but it does its job just fine. On the other hand we like the 55-degree wheel cut, which offers a high maneuverability into the tight spaces permitting you to drive the truck with ease even on the narrow city streets. 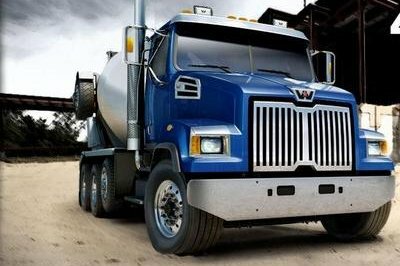 It will be hard to find a truck that is better built than the Western Star 4700. Its build quality is at the “bullet-proof” level and its rugged design copes great with the arduous missions. The cabin is also well designed and besides its superior build quality is also pretty convenient to leave with. The engines have already proven their value in other trucks and the tight wheel cut helps the Western Star 4700 to be easy to maneuver even on the narrowest streets.